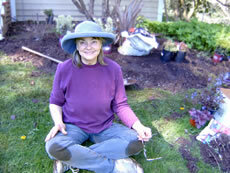 River City Gardens’ designs are influenced, as is Kathryn herself, by the beauty and serenity of the Pacific Northwest landscape—giant trees, rain, rivers, ocean and majestic sky. Our goal is to build gardens that look and feel as at home here as we do! River City Gardens is committed to professional, high-quality design and fair, ethical business practices. To help stay informed and to facilitate interaction with other business and design professionals, Kathryn is a member of the Association of Northwest Landscape Designers, Association of Professional Landscape Designers, The Hardy Plant Society of Oregon and Oregon Tilth. The Association of Professional Landscape Designers is an international professional organization the “advances landscape design as an independent profession and promotes the recognition of landscape designers as highly qualified, dedicated professionals”. My certification (approved November 2002) involved submitting a body of work and letters of recommendation from clients and colleagues with whom I have built gardens. River City Gardens received certification in Fall 2007 from The Pollution Prevention Outreach Team, a regional muti-agency cooperative group working toward a cleaner environment. It involved submitting a body of work that features sustainable practices and classes taken and taught that address environmental subjects. Ms Leech was the first landscape professional to receive this certification. An ecoroof consists of a layer of vegetation over a growing medium on top of a synthetic, waterproof membrane and significantly decreases stormwater runoff, saves energy, reduces pollution and erosion, and helps preserve fish habitat. I was awarded an Ecoroof Certifcate of Completion by the City of Portland Environmental Services on June 4, 2008. The certificate acknowledges my completion of four workshops pertaining to the structure, design and materials use, maintenance and the permitting procerss for the installation of Ecoroofs. I have been trained by the City of Portland-sponsored stormwater retrofit program. Besides being listed on their website as a resource for raingarden (stormwater facility) design, I am on their Clean River Rewards Professional Referral list here.